Over the weekend, I was happy to see chef Dominique Crenn announce her upcoming project, ~BAR CRENN~, over social media. It’s going to be opening next door to Atelier Crenn, in the space that Cellar Door wine bar is in. 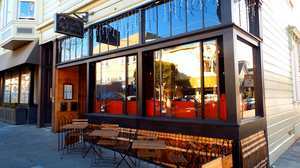 The Chron reports further that it will feature biodynamic and natural wines (curated by wine director Matt Montrose), older wines, low-ABV cocktails, and ports and Madeiras. There will also be some small plates and dishes to share. It’s going to be relaxed and a place to hang out with friends, or for a drink before or after dinner. The opening is looking like April 2017; I’ll keep you updated. 3131 Fillmore St. at Greenwich.